Moscow, July 3, Interfax - Monks of the Holy Transfiguration Monastery are involved in breeding peacocks. “There are already 20 of them, and majority of them were born on Valaam. 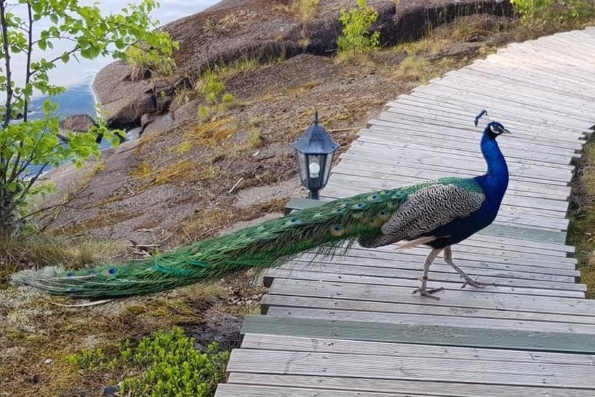 If you hear strange sounds from the other bank when you stay in St. Nicholas Hermitage on Valaam, don’t be surprised, it is Father Methody’s peacocks,” Father Superior of the monastery Bishop Pankraty of Troitsk writes at his page in a social net. Hegumen Methody (Petrov), Macedonian by origin, who has been residing on Valaam from 1993, is involved in breeding peacocks. He has also initiated numerous charitable projects for local residents, participated in reviving the monastery and developing pilgrimage and tourism on the archipelago. Besides, it was reported that Valaam monks started growing pineapples in greenhouses, and there are plenty of apples and other fruit trees in monastic gardens, some of them are over 100 years old. Animals and birds, including exotic ones, more and more often appear in Orthodox monasteries of Russia and become companions for monks and favorite pets for pilgrims. The Serpukhov monastery of Mistress and Presentation of the Holy Virgin in the Moscow Region was the first convent which started breeding peacocks. These beautiful birds are more and more often seen in monasteries not only in South and Central Russia, but also in Siberia. Other exotic for Russia animals make company to them. For example, a peacock, a duck with a drake and a young deer reside in St. Michael Arсhangel Monastery in the village of Kozikha, the Novosibirsk Region. Sometimes exotic animals and birds not only make the landscape beautiful, but also fulfill their social role. Thus, a camel was conveyed to the Novogolutvin Monastery of the Nativity of the Holy Virgin in the Moscow Region and then it became a pet of the Sunday school pupils.